I hope I copied and pasted this correctly. For y'all that have a few minutes, check out the story of the donkey foal at Auburn University that had a prosthetic limb designed recently. It is really an interesting read- if you have the time watch the video! It is the same prosthetic people who worked on the story Dolphin Tale. My daughter is taking classes at the Vet School there and she is totally impressed. She said it is an awesome facility. Evening Monkeys Hope everyone had a good day. Prayers for those in need of them. Babs and I had a another fun day. We went to watch JSM skate in her final skate competition this week. Had a great time. Happy to say only had to make one small side trip going. We are getting better driving around here in Texas. We had a great time, especially everyone in the ARENA watching me trip in warmup. At least I fell on my knees and not the tailbone. Stupid skates, getting new inserts so that they don't move around on me. Anyways, it was fun being with you, Babs, CC and my dad and stepmom. Afternoon Monkeys Hope everyone's having a good day. Prayers for all that need them. I just wanted to share something with everyone. We all have gotten the emails that give us helpful hints. Most of the time they don't work as well as they say. Today granddaughter got all in a panic as she found a tick on Bentleys leg. I remember a friend had sent me a helpful hint on how to remove them easily. So looked it up. Soak a cotton ball in liquid dish soap and rub it around for about a minute on the tick and it will back it's self out and should stick to the cotton ball. It worked the ticked backed out but didn't stick to the cotton ball. But I used a pair of tweezers and pulled it out of the hair. No problem. Of course it was in an area we could rub with cotton ball. Just thought I would pass it on. Everyone stay cool in the heat. Never thought of doing this on people. I HATE TICKS!!!!! Creepy little buggers. Chiggers are worse, but at least a bleach bath will get rid of them. 4 Donks I feel so bad for the farmers too, I cannot believe how much Farm Diesel costs now. I hope you have a lock on your tank because around here, people come and steal the diesel off the farms. I don't know about down there, but Farm Diesel here reminds me of cough syrup. Oh sweet Sister, I prayed for you all today at Mass. George and Connie are so blessed to have you. I PRAY that if anything ever happens to a family member I have the strength and courage to be as strong as you. Afternoon Monkeys Sad news Little Wally passed away this morning. Did everything we could for him wasn't enough. Took him out and buried him among the Oak trees. GE - I am sorry that you lost little Wally- and they do take hold of our hearts so fast. Your story of finding him reminds me of how Cad the Criminal came into our home. My son had found a baby rabbit and was taking care of it. Feeding it all night through a small bottle and keeping it in a "nest" he made. It didn't make it but for about a week and we had to bury it as well. He went to the humane society and saw Cad. Hubs and I caved in to his broken heart...the rest is history. She is truly a criminal! Sister- I have been thinking about you and George. Stay strong against the wind - George is so blessed to have you and your strength at this time in his life. On another note, the doctors have given Connie methadone to try and control her pain -- she is like a zombie. Talked with the doctor Monday and am headed to her house to take some medicine away. Good thing to take some meds away. Hoping the date went well. Just had to share a pic of my dinner! 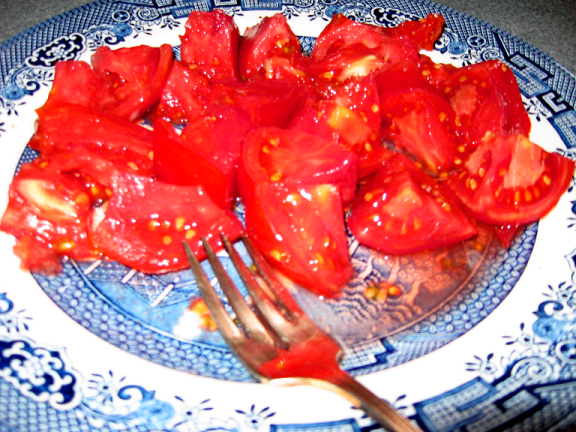 A plate full of fresh tomatoes from the garden; there's just nothing like the taste of fresh, home-grown tomatoes! I'll be having watermelon for dessert. Looks wonderful Brandi!!!!! I love fresh home grown tomatoes!!!!!!! Brandi- your tomatoes look mouth watering! On a side note, I have all of my grandmother's willow ware. We love car trips. Son and his wife and 2 daughters are flying down on Monday to Florida to stay a week with us...fun days ahead! Hi to all friends on here..
Brandi...love the plate of tomatoes..nothing better than fresh homegrown tomatoes...love that and watermelon with salt on them. I have to say that the watermelons that I have purchased this year have been really yummy. Have fun Cookie and so glad Molly is a good traveler. Be Safe!!! I like tomatoes, pepper, salt and Italian dressing.